Those of you that have been following my blog for a while know that I do monthly surveys of a local beach for COASST, the Coastal Observation and Seabird Survey Team. 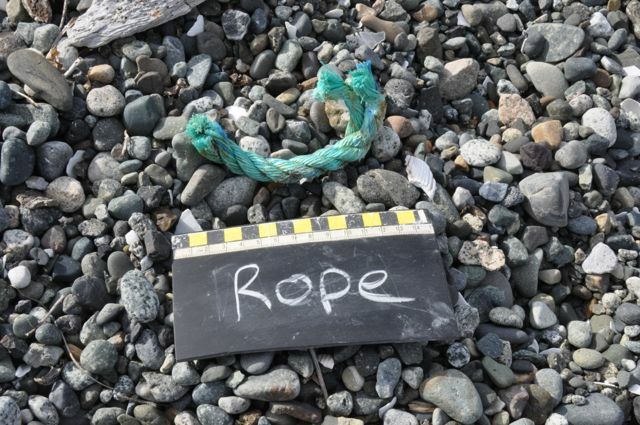 The main focus of this citizen science project has been dead seabirds, but as part of a National Science Foundation grant they're looking to potentially expand the program to include a marine debris survey. 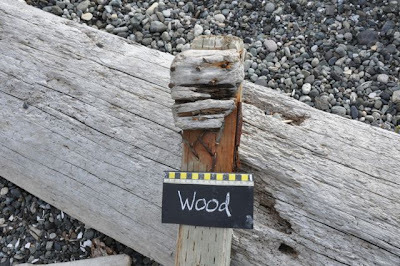 They asked current COASSTers to photograph some debris on their local beaches to help them start the process of figuring out how to categorize debris. 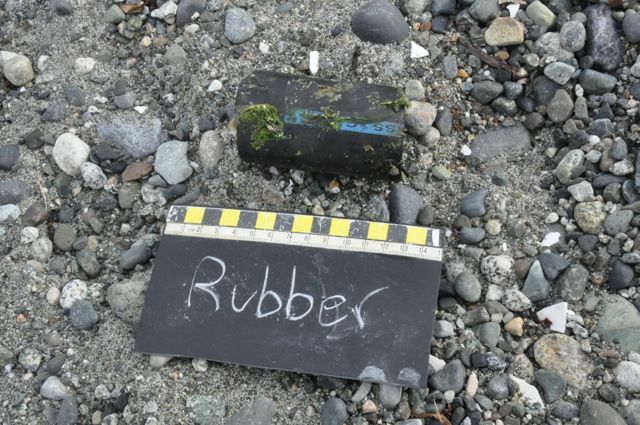 What's so interesting about surveying marine debris? You might be surprised! Recently, a lot of debris from the Japanese tsunami has been washing up on Pacific Coasts. 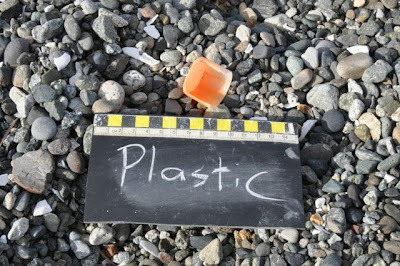 In addition to being interesting for beach combers, some of these debris pose greater risks than other trash in that they might introduce non-native species to our local coastal areas. 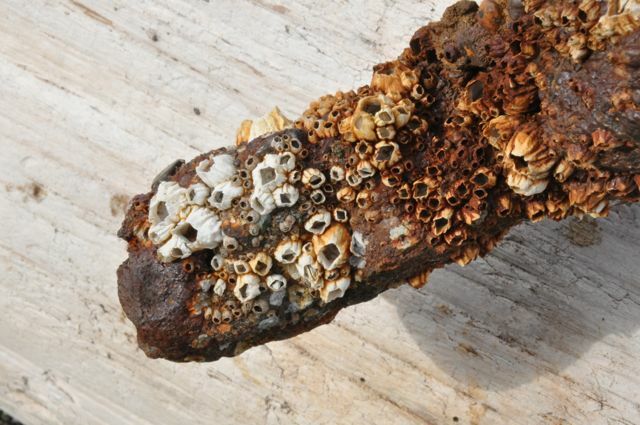 A piece of a dock that washed up in Oregon had almost 2 tons of living marine organisms on it. Some tsunami debris has even been returned to their owners; a basketball that washed up in Alaska was returned to a school in Japan, where the kids were thrilled to receive it back. It doesn't take a major marine catastrophe to make marine debris important, though. Even the run-of-the-mill beach trash may contain important information. Plastic lighters are notorious for their impacts on seabirds after being ingested in great numbers by birds like albatross. But did you know albatross are far more likely to ingest a red or orange lighter than a blue or black one? What if we could use this information to help protect albatrosses? I remember reading about a waterside clean up in the Puget Sound area that quantified the different types of garbage they picked up. I believe plastic bottle caps and lids over 2" are recyclable, while smaller ones aren't. They found large quantities of small bottle caps, and only one larger one. Does this mean recyclable items are less likely to turn up on beaches than non-recyclable ones? Debris can also tell us about weather and oceanic currents and how they influence debris. Have you ever heard about the 28,000 rubber duckies that fell off a cargo ship in the Pacific Ocean in 1992? They're still washing up on beaches 20 years later, continuing to inform scienctists about how our oceans work. Some have even found their way to Europe! It will be interesting to see what COASST comes up to do their marine debris survey. 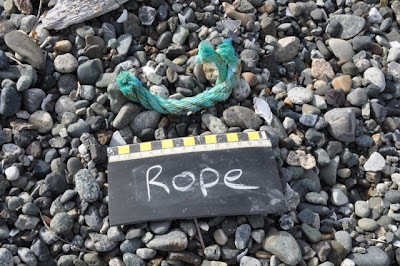 Some things they hope to do with such surveys include directing clean-ups to the most littered areas, further understand weather patterns that bring debris to shore, define which fisheries contribute to fishery-related debris, and look at the relationship between shore and ocean debris. While I found some debris (not that much - San Juan beaches are usually pretty clean), I didn't find any dead seabirds, as per usual. There was still plenty of else to look at, however including live birds. The winter seabird are starting to show up in numbers. There were probably 600+ scoters - mostly surf scoters but a few white-winged, too. I also saw 10 or more common loons, horned grebes, and red-necked grebes. Another surprise just because of their numbers was a flock of over 50 northwestern crow! 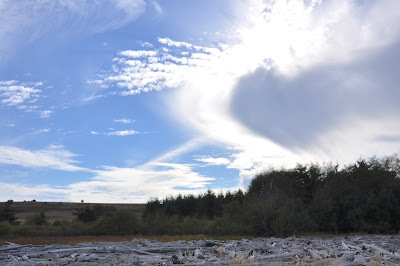 The one other picture I had to stop and take was of these clouds over towards the Straits. 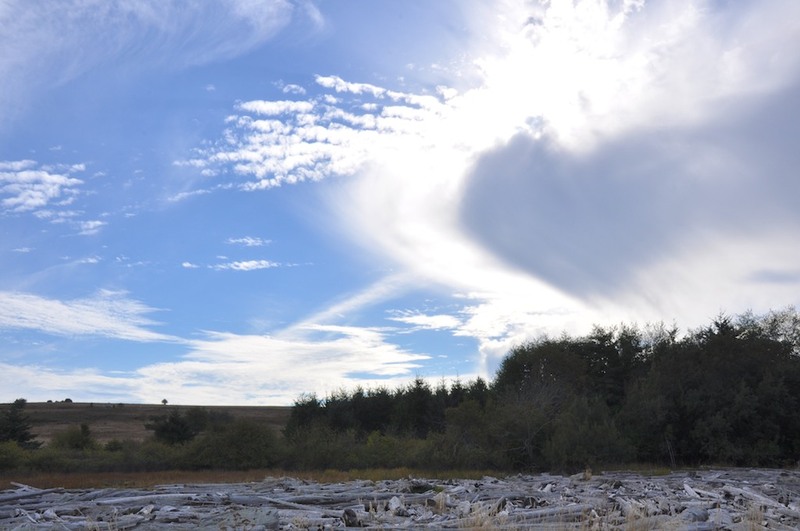 How many cloud types do you think there are in this photo? It was an impressive sight!